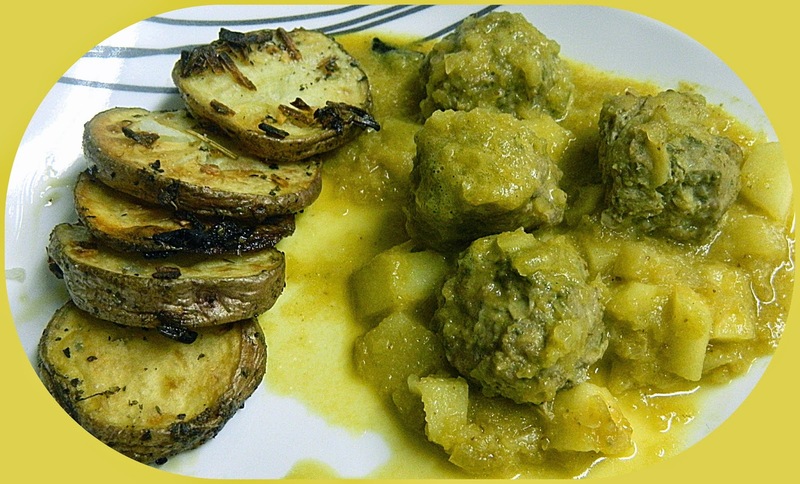 Meatballs with apples had instant appeal to me. I particularly like that the apples are both in the meatballs and in the sauce. There seem to be a lot of ingredients that go into this but when I collected everything, it was all in the cupboard or refrigerator. I made the meatballs first and while they were cooking, I prepared the gravy. The final dish was a dream come true; I left small apple pieces in the sauce instead of making it plain creamy and this was a good decision. It was a delight to get these chunks of apple which were still crisp with the creamy sauce and meatballs. I served this with roasted potatoes and a tossed salad. A true success story...... I felt happy feeding this to hubby and even better, I love it. 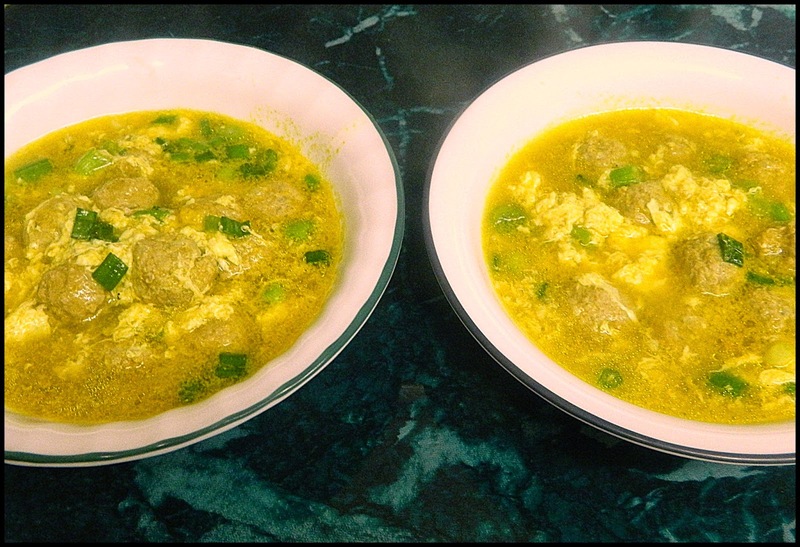 Not too long ago, I made an Italian Egg Drop Soup with Mini Meatballs which is similar to the soup, we made tonight in our Ellie Krieger group, Eating With Ellie (EwE). 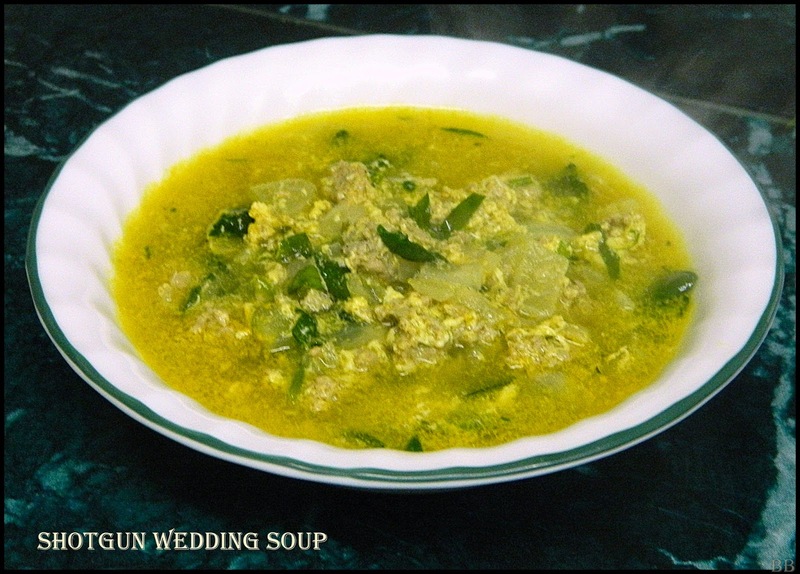 I knew, I would like tonight's soup, Shotgun Wedding Soup which is also of Italian origin because it had chopped turkey, spinach and egg drops, as did the previous soup. I liked the meatballs better than the browned turkey but it was still a very good soup. It contained, onion, (garlic), ground turkey, salt, black pepper, broth, parsley, eggs and spinach. It was easy to make and I had it ready quickly for my hungry hubby. He is happy that once again, I am cooking Ellie Krieger recipes and so am I. 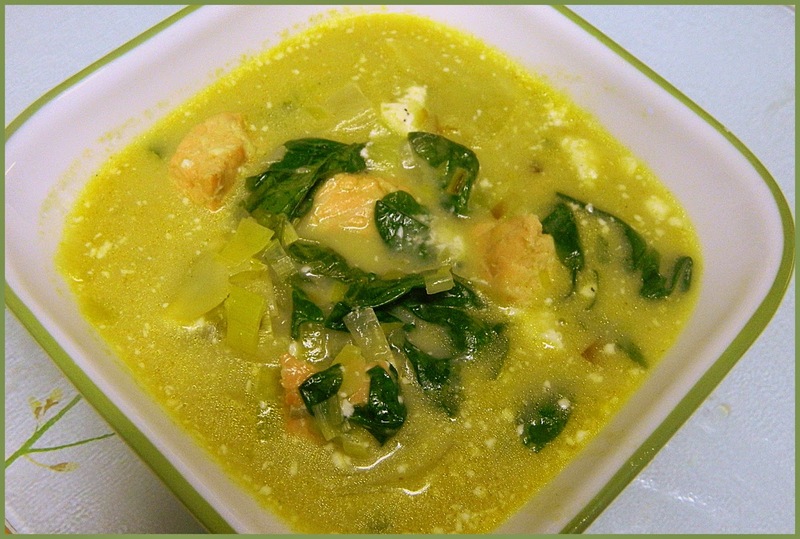 All the members who made this soup will be found at this site dedicated to Eating with Ellie. We welcome new members so come on and join in or if you just want to cook, on occasion, that is also fine with us. I selected this dish for this week. It is the kind of dish that will always call my name. Especially after refilling the arborio jar when it didn't need it is as anincentive to make more risotto. Who could turn away nice and creamy rice like this? This is for my Donna Hay group, WwDH. Wednesdays With Donna Hay. You can find all of the links here. Please do go and see what others have done with this dish. As it turned out, we made risotto, two weeks in a row but this is the kind of dish that is usually welcome. I selected it for the spinach and feta. Actually, I forgot to add the nuts. 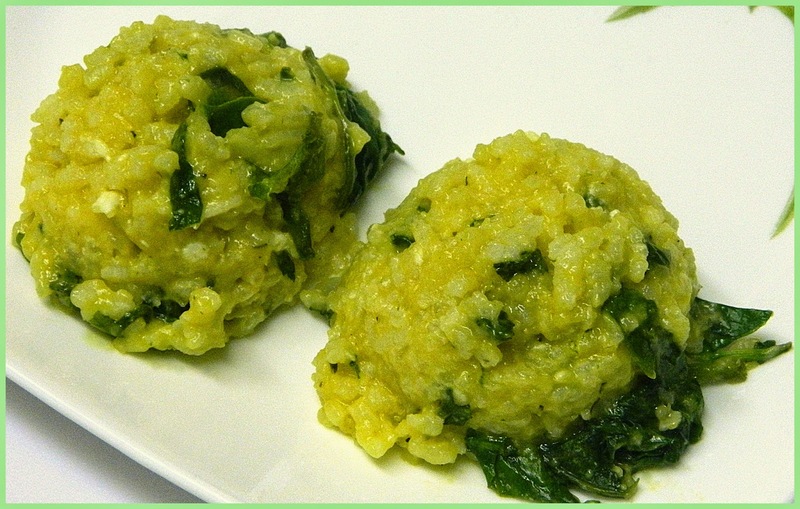 The ingredients are arborio rice, chicken stock, parmesan. butter. sea salt and cracked black pepper, baby spinach leaves, feta, and pine nuts. Sounds like a good combination and it is. I made this during the week I cooked mostly Rachel Ray recipes. I am happy to report that every recipe was filled with flavor and disappeared quickly. Three cheers for Rachel. Right now, we are waiting for snow, snow and more snow and the temperature is presently 24 degrees. Although I have to go to work today, I doubt tomorrow that school is going to be open. Warm food is called for and I am thinking of trading off my roasted eggplant with a nice hearty soup. Menu plans are meant to be changed when one only hears warnings of what is to come. It brings to mind, Hurricane Sandy, some time over two years. My daughter had just gotten engaged and we invited everyone over to celebrate (before we knew what was coming) and I started cooking and baking. Then the hurricane hit and we lost our power for two weeks including the evening of the big shindig. Fortunately, the mother of the groom jumped in and took over. A while back, Joy Bauer sent me her book, Slim and Scrumptious. At the time, I made a few dishes and posted them although I am not sure what blog, this was on. I pulled the book off the shelf where it unfortunately has been living. What a waste of time. Joy has delicious looking recipes and it was easy to find several to make this Joy Bauer week. In fact, I selected too many and I am still trying to decide which to eliminate. "Joy Bauer is one of the world's leading authorities on health and weight loss. As the nutrition and health expert for NBC’s TODAY show, Joy shares reliable, practical, and easy to follow advice that helps millions of people eat better, live healthier, and lead more fulfilling lives. She also hosts the program’s popular “Joy Fit Club” series, which celebrates determined people who have lost more than 100 pounds through diet and exercise alone." I make chicken weekly and over the years have made a variety of dishes. I wonder which wins in quantity salmon or chicken. Both are popular in our household. 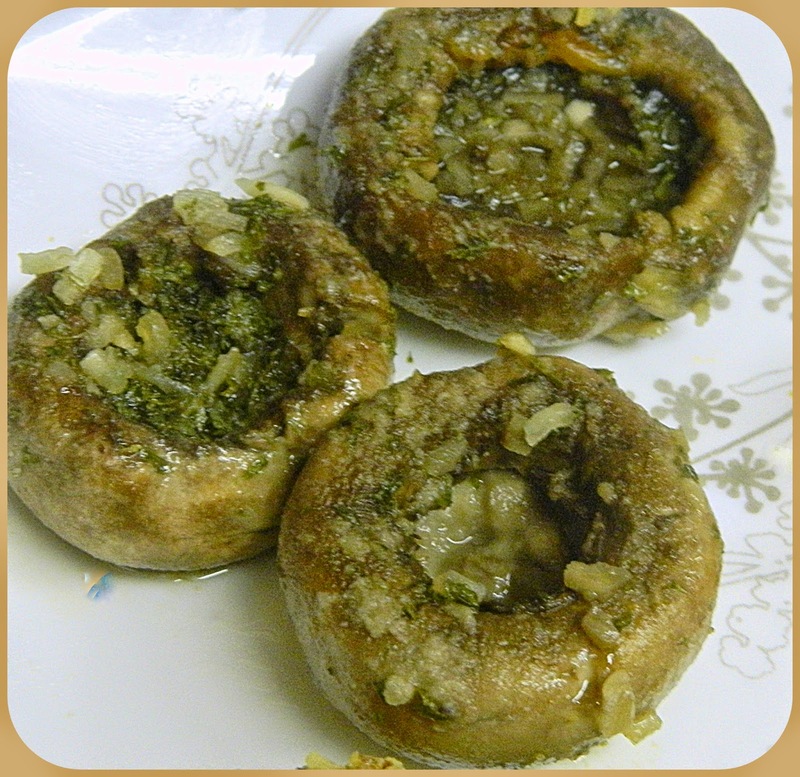 Both are easy to adapt with different spices or with different vegetables. Both go with pasta, rice or quinoa. 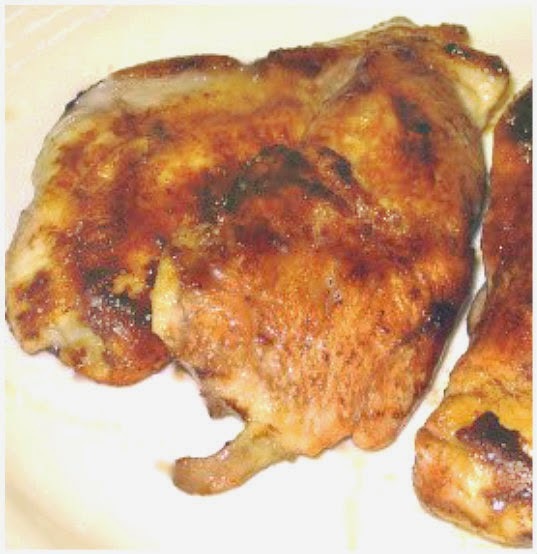 Here are just a few ideas on how to use chicken. Each one has a link attached so you can find recipes, not my recipes but good ones. 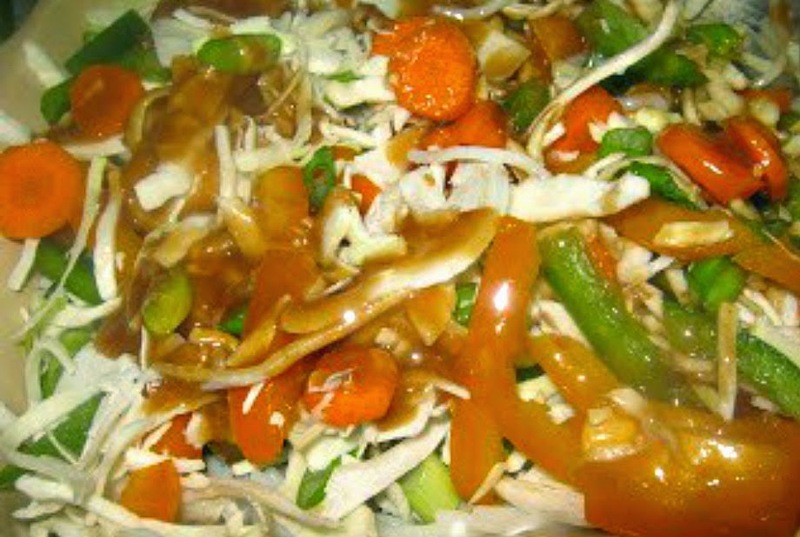 I chose, from this Wikipedia list, the chicken dishes, I have made. I found this wonderful recipe on Bon Appetit, a blog, not the magazine., Go take a look and see for yourself. I knew it would be a hit and even though, I was missing some of the ingredients, I went ahead and put it together. What a success!!!! It was easy to make and delicious to eat. For the original recipe, go to the source and get all the details. Of course, it doesn't hurt that this is a recipe, originally from Nigella Lawson, one of my favorites. What I like about her is the way she writes her books, with cute phrases, hints and interesting pieces of information. It is like reading a novel with fantastic recipes included. 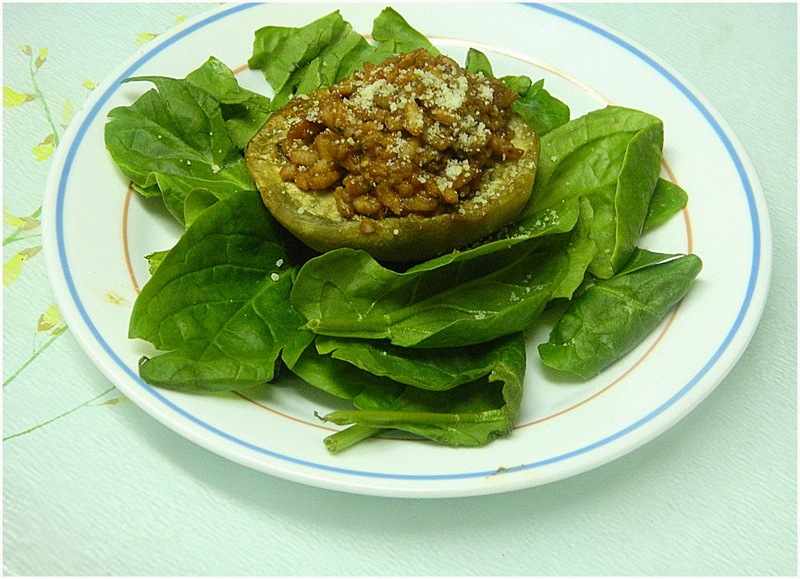 This recipe is from a few years ago and I see that she has a new recipe for this salad that looks interesting too. It is on Food Network. I made something similar to this, in the past, but the meatballs had rice in them and the seasoning was different. I am sure, I am not the only one who does not want to repeat recipes but after a certain amount of time, without even knowing it, finds it has to happen. I found out about this one, when I went to get my photo and saw a picture and grabbed it. My mistake of course, was that it was a different soup. Below is the photo and you probably can see, why I confused them. If you look closely, you can see the rice in the meatballs and even the way, I broke the egg down is different. Bring the stock to a simmer. When, I first started blogging, I used a lot fewer ingredients than I use today, particularly in the area of produce. I was a lettuce, tomato and cuke kind of person, of course using potatoes and onions. I didn't use too much more. I did buy lots of frozen vegetables such as broccoli and cauliflower and i still do. If you asked me about leeks, kabacha, bok choy, even garlic. (I knew what garlic was but not what it looked like.) We ate well despite these limitations. This is the first week of Eating with Ellie, the one and only Ellie Krieger, who cooks health consciously and deliciously. The recipes, at this point are coming from the book, Weeknight Wonders . About a year or so ago, we had a group of dedicated women who belonged to CEiMB (Cooking Ellie in My Belly), a name I never liked. What I did like were the participants and the recipes. 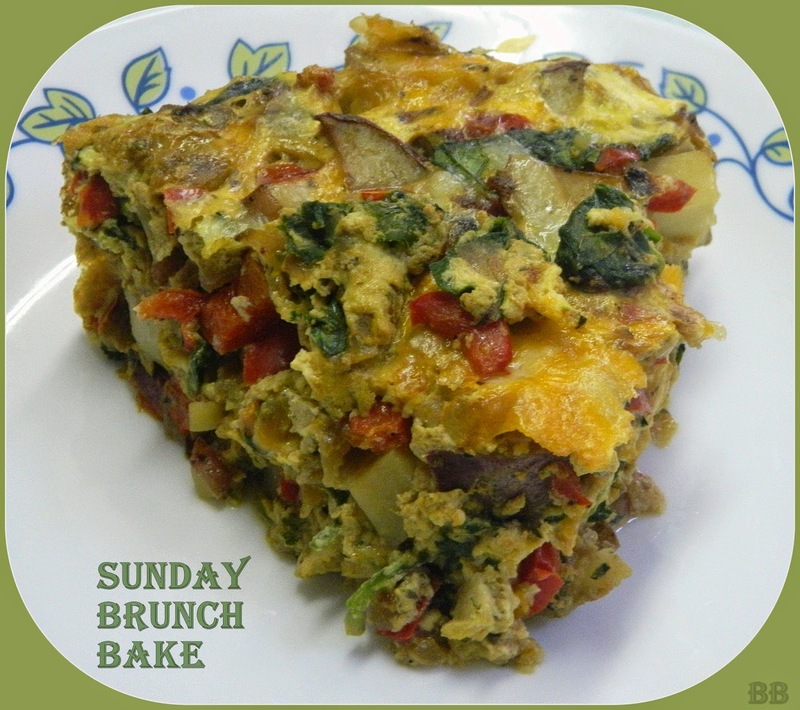 Each week, hubby and I would kvell over the delicious meals, I made with ease and joy. I have three of Ellie's books and they are well used. Hey, Hey Donna Hay.....we are back with this lovely eggplant with tomato, basil and parmesan rissoto. Sound good? Well, it is. 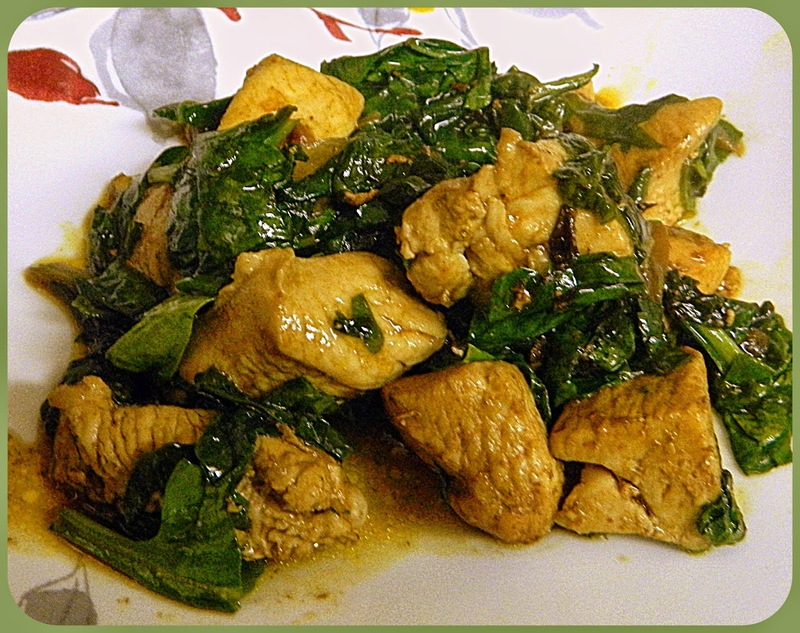 Margaret chose this recipe and it is from one of Donna Hay's books, New Food Fast. Hubby wasn't thrilled with eggplant and would have been happier eating only the risotto. I had no idea, he is not a fan of eggplant. I love it, made in certain ways and I make if often. He has never said a word. I am pretty sure, it does not fall into the same category as asparagus which he simply despises. I think that it is more a "take it or leave it" dish. This was not my favorite way of making eggplant either so this dish is probably not going to be seen again. I think, if you like risotto, this is worth a try. The sauce was broth, wine and tomato puree and I liked that very much. Lots of basil and a little black pepper and Parmesan seasoned the dish. I was about to make a Rachel Ray Potato Cake when I remembered, I had torn out from a Food Network Magazine, a recipe for a potato cake that looked more interesting. Rachel's used sliced potatoes like a crust and the Food Network recipe used mashed potato. I will always vote for mashed over sliced. This is the epitome of comfort food. The mashed potatoes are creamy, the cheese adds zest and roasted red peppers were just right. I am proud, I took only one generous slice. Hubby ate the rest of the nine inch cake. My guess is children would like this even with the red peppers. 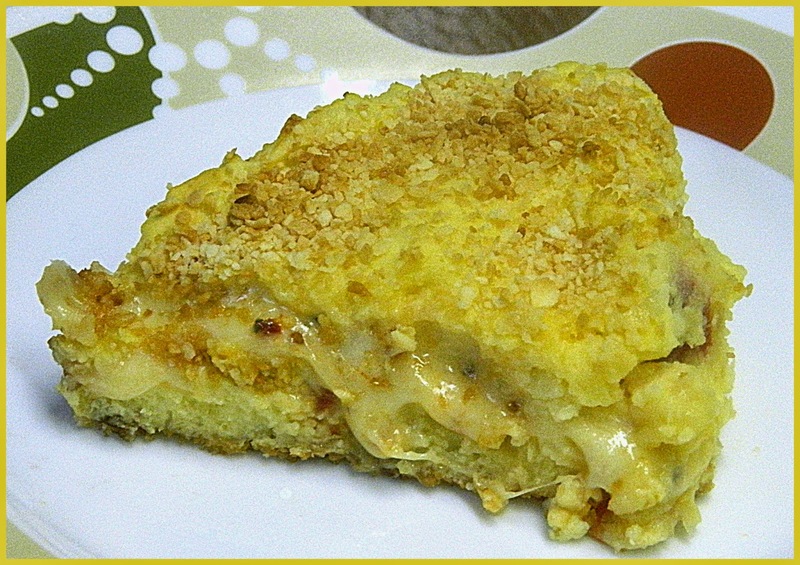 Next time, I would like to add caramelized onions to the cheese mixture. I used smoked Mozzarella because I had it, in the house. I had gotten it for my grandkids but they left a good share of the package behind. It worked perfectly.